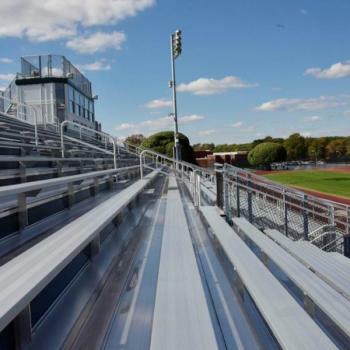 As the leading producer of extruded aluminum stadium decking systems, benches and rails, Southern Bleacher knows aluminum coatings and aluminum finishes like nobody else. We offer up to five options for our aluminum products and recommend specific coatings or finishes depending on where the aluminum is being used, aesthetics, durability and budget. It&apos;s important to understand that aluminum is inherently durable! Even without any finish or coating, Southern Bleacher aluminum stadium decking, benches and rails are impervious to corrosion from the elements. Note also that there is only a minor cost difference between choosing anodized, powder-coated or premium Dur-Kyn paint finishes for your stadium project. Mill finish aluminum is aluminum exactly as it comes out of the extrusion, without any coating applied. Within seconds of exposure to air, an oxide coating forms on the aluminum, protecting the underlying metal. the treads in 99% of our stadium designs - the walking surfaces that are continually marred from foot traffic - to make the most of project budgets. Anodizing isn&apos;t applying a coating like paint. Instead, an electrochemical process converts the surface of the aluminum into a durable anodic oxide that&apos;s structurally integrated with the underlying metal. it is the most cost-effective finish for benches, risers and rails - surfaces that spectators see, touch and sit on - as it prevents the chalky coating that can be picked up from unfinished aluminum. Even the best companies get better with experience! While powder-coating has traditionally been the go-to solution for color on aluminum, it doesn&apos;t always have the enduring quality we want. Depending on pigments, powder coatings can fade faster than other paint methods. For essentially the same cost, we typically recommend our premium Dur-Kyn paint. looks great fresh from the factory but can scratch easily. Some powder-coat colors also fade with UV exposure over time, even out of direct sunlight. For these reasons, powder-coat paint is best reserved for indoor venues and surfaces that get little hand contact or foot traffic. 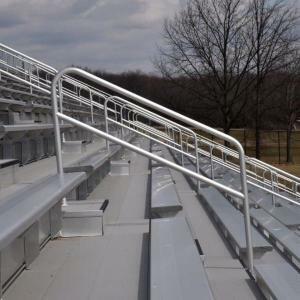 Around 2000, after years of mixed satisfaction with the longevity of aluminum powder coating, Southern Bleacher set out to commission an aluminum paint innovation that would live up to our exacting standards - not just for a year or two, but for decades. The result was our Dur-Kyn process - an adaptation of the same paint technology used by airlines as well as Mercedes Benz and BMW. 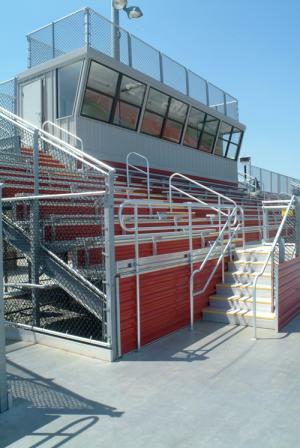 To date, Southern Bleacher has never had to replace a single piece of aluminum finished using our Dur-Kyn premium paint process due to color fade. 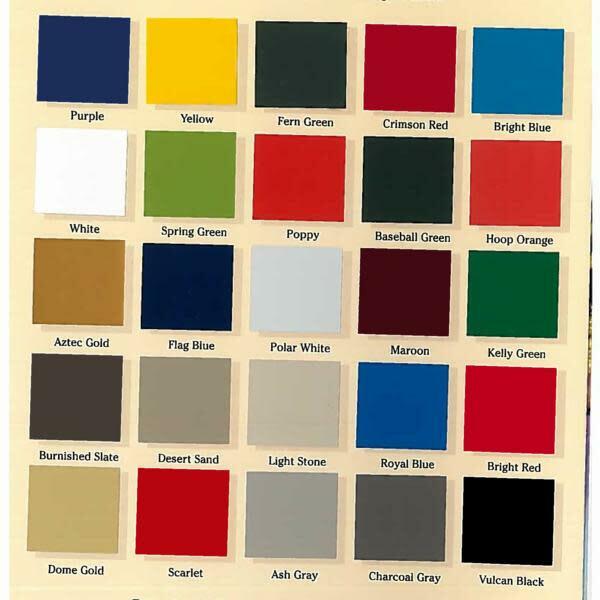 for any aluminum surfaces that need color - not just those you look at, but also surfaces for sitting or walking. 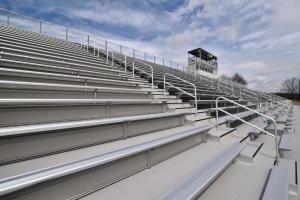 Our Dur-Kyn paint is durable to withstand the harshest elements and treatments for all bleacher components. Note: Choosing paint over anodizing is purely an aesthetic choice - both serve the same functional purposes, and they have no synergistic qualities like paint over galvanized steel. Serrated Extrusion by Design that rain, spilled drinks or other moisture doesn&apos;t compromise spectator safety. There are three approaches to protecting your fans and increasing the coefficient of friction on treads - textured traction finish treads for those who prefer a grip-style walking surface. is the leading stadium builder with dies that create a ridged, serrated traction surface intrinsic to the extruded aluminum. The shape of this extrusion allows fluids to gravitate into the "valleys" of the aluminum, leaving the "peaks" safer for walking spectators. By design, our serrated decking provides a safe traction surface, even when left at a mill finish - the only slip-resistance technology that doesn&apos;t diminish over time. A second option is to shot-blast aluminum after extrusion, roughening its surface but also making it more susceptible to staining - an issue mitigated by then anodizing the aluminum to create a protected traction coating. The process of anodizing "flattens out" some of the roughness from blasting, and what remains is a suitable walking surface that wears over time. A third option is to apply paint mixed with an abrasive. While powder-coat paint doesn&apos;t hold up as well to foot traffic, our Dur-Kyn paint combined with an abrasive and applied to our already serrated-traction extrusions, creates the most slip-resistant aluminum traction coating in the industry. We&apos;ve witnessed our premium traction coating stand up year after year to baseball players running up and down bleachers without their metal cleats wearing down or even penetrating the surface!